32 W INTER 2018 PracticeLink.com T E C H N O T E S DIV-10500-17 63586 We are inspired every day by those we serve and teach We maintain an inviting culture where talented, experienced individuals contribute unique ideas drawn from their diverse backgrounds, experiences and beliefs. We value one another as members of one team committed to compassionate, excellent service to our patients, our community and to each other. 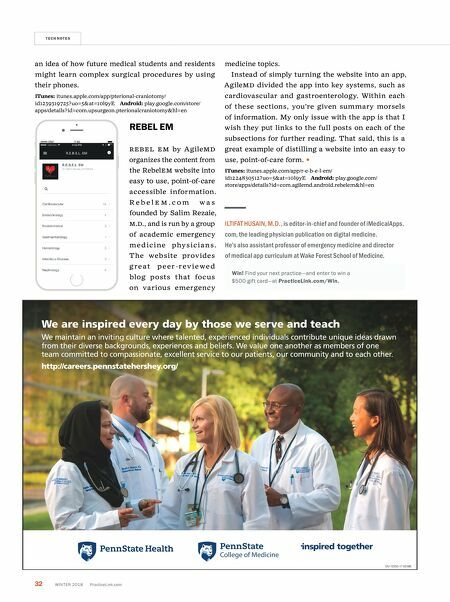 http://careers.pennstatehershey.org/ an idea of how future medical students and residents might learn complex surgical procedures by using their phones. iTunes: itunes.apple.com/app/pterional-craniotomy/ id1239319725?uo=5&at=10l9yE Android: play.google.com/store/ apps/details?id=com.upsurgeon.pterionalcraniotomy&hl=en REBEL EM R e B el e M by AgileM D organizes the content from the Rebel e M website into easy to use, point-of-care accessible information. R e b e l e M . c o m w a s founded by Salim Rezaie, M.D., and is run by a group of academic emergency me d ic i ne phy sic i a n s . T he website prov ides g r e a t p e e r - r e v i e w e d blog posts that focus on various emergency medicine topics. Instead of simply turning the website into an app, AgileMD divided the app into key systems, such as cardiovascular and gastroenterology. Within each of these sections, you're given summary morsels of information. My only issue with the app is that I wish they put links to the full posts on each of the subsections for further reading. That said, this is a great example of distilling a website into an easy to use, point-of-care form. iTunes: itunes.apple.com/app/r-e-b-e-l-em/ id1224830512?uo=5&at=10l9yE Android: play.google.com/ store/apps/details?id=com.agilemd.android.rebelem&hl=en ILTIFAT HUSAIN, M.D., is editor-in-chief and founder of iMedicalApps. 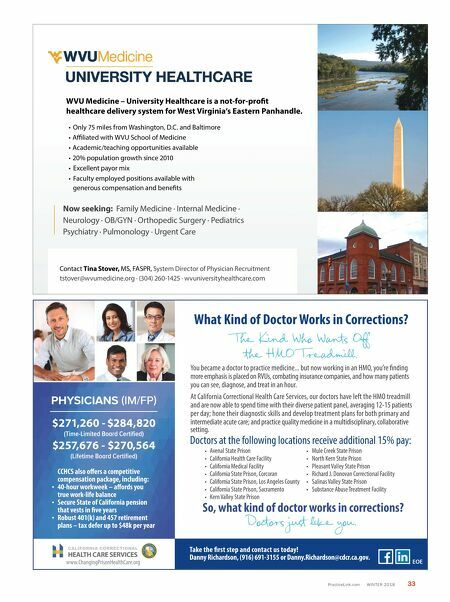 com, the leading physician publication on digital medicine. He's also assistant professor of emergency medicine and director of medical app curriculum at Wake Forest School of Medicine. Win! Find your next practice—and enter to win a $500 gift card—at PracticeLink.com/Win.